When they brought Moussa over and laid him in my arms, my heart stopped for a minute. He was barely breathing and was so frail, I was afraid he might die as I held him. Though he was more than two months old, his arms and legs were tiny and frail and his breathing was labored. 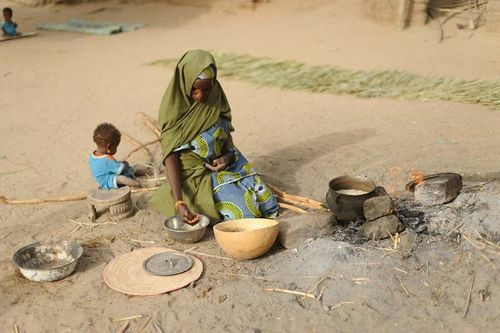 Here in a small village outside Diema in the West African nation of Mali, I saw what the face of hunger in the latest food crisis in Africa really looks like. 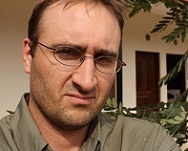 It is the face of Moussa. Moussa’s mother, just 18, brought him over to us when she saw the Save the Children car drive up. He had been identified that day by a health worker trained by Save the Children and now we needed to get him to the town for help. Moussa and his mom were bundled into the car and they sped away to the center in Diema, about 10 kilometers away, where Save the Children-trained staff were there to help him and food and medicine was available from other partners like UNICEF. The produce section at Ahmed’s shop is nothing short of impressive. Onions as big and red Christmas tree ornaments shine in the sun. Next to them, garlic the size of cats’ heads gaze up at customers. In the next bin, heaps of mangoes doze in the shade, waiting for their turn in a juice machine. On hot days, the juicer is a hit with people ready for smoothies ranging for guava to avocado. But this is no swank gourmet store in Los Angeles. It’s a shed in the Dadaab refugee camp in Kenya. The aisles are sand alleys where shoppers weave between dozing donkeys and smoking garbage. Dadaab has been here for 20 years and has worn, lived-in feel to it. To cater to the 440,00 refugees living here, markets have sprung up where you can buy everything from slick cell phones to knock-off European perfumes. But most shoppers make a beeline for the basics: onions, potatoes, and eggs. It’s a selection many never had in Somalia, a country that’s been on a slow downward slide for years. Food choices, especially in the countryside, have become limited. Most Somalis grew up with only two options: camel meat and camel milk. In a country where, in some places, camels out number people, dinner for many means fried camel meat washed down with sussa, camel milk that is left in the shade to ferment. Some children drink nothing but camel milk for the first few years of their life. The food selection in Dadaab for many years wasn’t much better, a meager array of shriveled produce and canned goods. Most people relied on processed food from aid agencies. While it was welcome, it wasn’t satisfying all the nutritional needs of children. That led to frightening rates of malnutrition. But now, thanks to Save the Children, there’s a food revolution happening in this unlikely place. 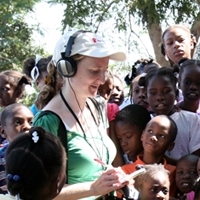 With financing from the French Government, Save the Children started a program in which vouchers are given to parents with children between 6 and 12 months old to buy fresh food and vegetables from select vendors. Parents receive vouchers worth about $10 a month that they can redeem at 45 vendors throughout the camp. The idea? Don’t wait for children to become malnourished and then try to save them. Feed them the right foods during the critical months of their life. The project has led to healthier children, and parents are saving money. But maybe most surprising: It brought about an evolution of the Somali palette. And that has led to an increase in profits for businessmen. Just ask Noor, the quiet father of nine came to Dadaab in 1993. For years he lived on the food he received in the camp but wished for something else. “We never liked it, but the circumstances forced us to eat it,” he says. In 2005, he opened a shop in the Ifo section of Dadaab camp. Most of his time was spent snoozing the day away, waiting for customers. He only sold dry goods like salt, powdered milk and rice – the same things most everyone else sold. On an average day, he’d make $1 to $2 profit. Now, with the arrival of Save the Children’s fresh food voucher project, there’s a steady stream of shoppers squatting next to his vegetable bins, rifling through tomatoes, oranges and onions. He goes through, for example, 110 pounds of potatoes and 45 pounds of onions every week. He now makes $10 a day and is using that money to send his son to private school. He’s also constructed a house in Dadaab and he’s expanded his shop. What if the voucher program was to stop? Noor shook his head. We would have “absolutely no business at all,” he said. The project goes beyond nutrition. For parents to qualify for vouchers, they must show proof that their children were immunized and had their growth monitored at a clinic. This simple strategy has meant more than 50,000 children have been vaccinated and their health is carefully monitored. Save the Children follows up with parents in the program to make sure they understand nutrition messages. And what foods provide what nutrients. But many parents have never seen pineapples or parsley, and are baffled about how to prepare them. So Save the Children provides cooking demonstrations to moms whose children have qualified for the program. Think Emril Live or Rachel Ray, Dadaab style. The fresh food revolution in Dadaab has meant big changes for people like Ahmed Kalif. The former school teacher who speaks solid English has henna-orange hair and gentle demeanor. He points to the giant sacks of potatoes in the back of his shop. He’s become so successful, he says, that he now sells wholesale to other shop keepers in the market. “I have 200 customers a day who buy with vouchers,” he says, adding that they buy 150 pounds of potatoes a week and hundreds of eggs. One of them is Fatuma Abdi Yussuf, a customer who regularly visits Ahmed. She says the days of bland porridge are over. Arfon Yussuf Abdi, a grandmother who frequents Ahmed’s shop, said she was worried because she knew her grandchildren weren’t getting the proper vitamins and minerals. But now that she has access to fresh kale—a vegetable with so many micronutrients, it seems like there’s a health food store in every leaf—her grandkids are much healthier. 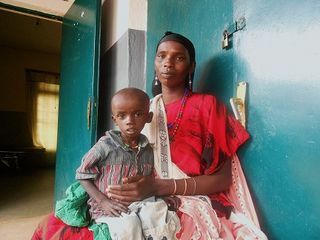 Dido has been battling for his life at a Save the Children emergency nutrition program in drought-affected Ethiopia. I was so grateful for our staff and supporters that made this program possible. He wouldn’t have had a chance otherwise. As I sat by his mother Garo’s side, my only thought was to comfort her and her son as she told me of their hardship and suffering due to the drought in East Africa. The small puppet I played with put a faint smile on Dido’s sunken face. Malnutrition weakened the little boy and a cold escalated to pneumonia. Dido became a shadow of his former self, weighing 15 pounds – about half of his ideal healthy weight. Garo faithfully fought for her son’s life – feeding him fortified milk and porridge all hours of the day and night. Constantly by his side, she stays with him sleeping on a small gurney in Save the Children’s dedicated malnutrition unit. Garo knows the pain of losing a son; Dido’s nine-year-old brother died in an accident. Her sorrow washed over me as I saw her lips quiver and tears streams down her cheeks. She wept silently, not wanting to upset Dido. “I will not lose him,” she said fiercely. I told Garo Save the Children health workers brought me to see Dido’s progress. In just a few short days, he gained more than 2 pounds and was on the road to recovery. 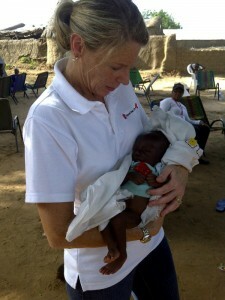 “I have no words to describe how grateful I am to Save the Children,” she said, pressing her hand to her heart. When I saw Mardya, my heart sank, then welled up and out to her. Mardya was little bigger than a newborn even though she had already had her first birthday. 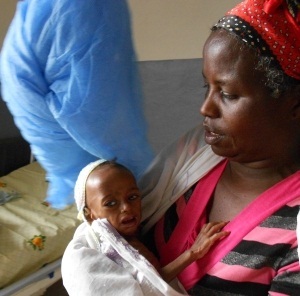 The nurse told me she was diagnosed with severe acute malnutrition. Despite her serious condition, Mardya was alert and reached for me with her with tiny, thin fingers. Mardya’s mother died shortly after she was born, leaving her and her five brothers and sisters. Her father was devastated and has been doing his best to care for his six motherless children. All his cows died in the drought – bankrupting the entire family. The loss of the herd also cost Mardya her only source of food. With no mother to nurse her, no cows to milk and no work for her father, Mardya became malnourished. Severely malnourished babies like Mardya risk death due to total organ failure and must receive rehydration, nutrients and medications. Mardya was immediately admitted to a emergency nutrition center. She was fed fortified milk at least 8 times a day with loving care by the wonderful health workers and community volunteers I met at the center. She also received specialized medical care and supplements. She quickly gained two pounds and was released. But just a few weeks later, Mardya caught a simple cold and it progressed to pneumonia. Thankfully, a Save the Children-trained health worker found out before it was too late. She was immediately brought back to the emergency center. Sadly, Mardya lost all the weight she gained. Pneumonia caused her to rapidly lose muscle and fat, and food at home was still scarce. In addition to therapeutic feeding, Save the Children nutrition experts recognized that Mardya would need much more support. They identified a community volunteer, a family friend and neighbor, who would help care for Mardya. She will receive more frequent visits and check-ups until she fully recovers. Part of my heart remains with Mardya and a piece of me wishes I could have stayed to take care of her myself, but I know she is in good hands with my trusted colleagues and new friends in Ethiopia. After a week in Dadaab, the world’s largest refugee camp, I realized something: Aid workers work day and night. I’d wander over to the office at night and someone would be leaning into their computer, face aglow. There’s not a lot to do here in during down time. I asked a colleague what she did to unwind. “I listen to loud music,” she said flatly. Some retreat to quiet corners and Skype with family members far away. Others run around the perimeter of the United Nations compound, calves burning as they churn through the soft sand. What did I do? I stretched out in my tent and made lists. I have one in front of me now. It’s all the people I met in Dadaab. I’d like you to meet five of them. Their stories are the jaw droppers you hear in the camp. But their spirit, drive and kindness are the qualities that you see in the camp but rarely read about. Hussein has resilience. I met the 13 year old Somali boy sitting outside of the Save the Children office. 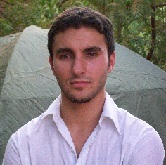 He’d recently arrived in the camp and was living with a sister. He tried out his limited English with me, then we fell into a conversation about airplanes based solely on sign language. It was clear that his sister was having a hard time supporting him. His T-shirt was badly stained and his pants didn’t fit. He shined shoes in the market, a smart business move given the constant blowing dust and sand. He happily showed me a scar on his leg he got from thugs in Somalia. Despite his tough life, he was all smiles. Save the Children was helping him and he’d just received a new red T-shirt. Noor has perseverance. He’s the proud owner of the "Praise God" boutique in Ifo market, a spacious zinc shed with piles of tomatoes and onions on display. Not long ago, before he got involved in the Save the Children fresh food voucher project, Noor was struggling. Customers weren’t buying his paltry selection of dry goods. Even he admits, his selection stunk. He’d make around $2 profit on a good day. Not exactly enough money to feed nine children. But now, thanks to Save the Children, he makes $10 a day and customers flock to him for his potatoes, tomatoes and onions. 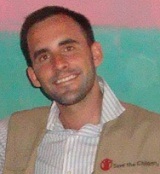 Save the Children’s fresh food voucher projects has changed his life. Najib has a personality that won’t quit. I met him at the child friendly space in Hagadera. He was clearly the big man on campus despite the fact he didn’t weigh 40 pounds. He had a personality that filled the room and dance moves that would make Justin Timberlake jealous. And not an ounce of stage fright. He belted out Somali tunes, while strutting in front of a crowd of fans (kids sitting on the floor). And just think: Not long ago, Najib arrived alone in the camp. The child friendly space has brought him out of his shell. Najib, I could tell, has a bright future. Rose has patience. She runs Save the Children’s Dadaab operation. She’s makes decisions that affect the lives of thousands of refugees every day. These challenges would send weaker women running for the comforts of the city. But Rose is never crabby or flustered. She’s passing this cool demeanor on to her children. Consider this: Her 4-year-old daughter, who is cared for by a relative while Rose is in Dadaab, saw hungry Kenyans on TV and refused food. She had enough food, she declared, and wanted to give it to those in need. Rose convinced her people in need were being helped, that she needed to eat. She relented. One thing is clear: she has her mom’s heart. Magala Hafow, 34, has lived in Ethiopia for exactly 23 days. 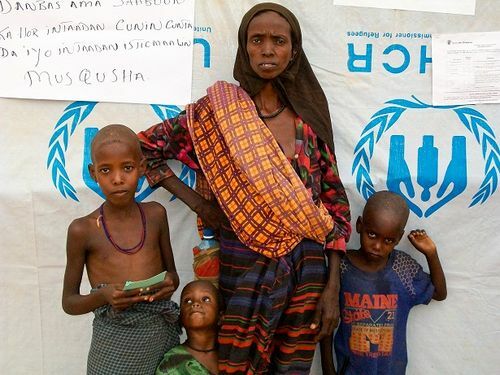 She is one of the thousands of Somali refugees who have fled their home to seek food and safety in the refugee camps across the Ethiopian border. The journey from Somalia to Ethiopia often entails great peril for asylum seekers who must walk for days on end to reach the border with little food and water. For Magala, this journey was particularly scary. She is the mother of three boys, ages 4, 5, and 10, and is five months pregnant. While giving birth to her 5-year-old, she developed a severe eye problem, which has deteriorated to the extent that she cannot see well. She says that she is gradually going blind. But despite these tremendous obstacles, deciding to make the difficult journey from their home to Ethiopia was very simple. “We came here because I was scared for my children,” she says. “It was the only option we had. Because of the drought there is no food in Somalia; children were dying of hunger. I just want to get food and medicine for my children.” She describes witnessing the landscape around her small town, Kasa Hadere, transform into desert over the course of the past few months. Her husband, a farmer, had become very ill and could not work and Magala’s sight had deteriorated to such a state that she could no longer work either. Though Magala and her family have now made it to Ethiopia, their journey remains unfinished. She and her sons have been living in the temporary intake centers in Dolo Ado where asylum seekers are registered and granted official status as refugees. The refugee camps, 30 miles away, have been so overburdened by the massive surge of arriving refugees that they can no longer accommodate any more people. The construction of a new camp is underway but in the meantime Magala and her family must continue to live in the transit center where nearly 11,000 other refugees are waiting to be registered and relocated. When we last left Carolyn, she had just met Abdi, a 13-year-old boy who travelled to Kenya alone. On his first day in Hagadera, the day before we met him, Abdi was wandering in the market. "My husband found him crying and stopped to talk to him. He told him he was alone and his parents had died" said the young woman named Nimo who lives here. "He brought him home to me and now we are caring for him". I could not help but think how generous these people were. They lived in a small mud and stick house with a simple open kitchen made of sticks and yet they were willing to take in this little lost boy who needed everything. I asked Nimo to tell me a bit more about how she came to be in Hagedera camp. "I came here several months ago from Somalia with my husband because there was so much war," she said sadly. When I asked about her other children she told me that her first child, born in Somalia, had died from "disease" at 7-months. Probably something that could be prevented but given the horrific state of healthcare in Somalia, likely the child never saw a doctor or healthworker at all. I understood a little better why this young couple had wanted to take Abdi in. As she spoke with us, Nimo kept glancing at Abdi to check that he was okay. She patted his knee to reassure him as we talked. Nimo told us she wanted to take care of him and we asked what he needed. "A mattress and supplies so he can go to school next month" she said. These are things Save the Children will provide, along with the support we give to families who are willing to foster children while we look for their parents or relatives. Since Abdi's parents are dead, we will search for realtives here in Kenya. In the meantime, Save the Children staff will come back to visit Nimo, her husband and Abdi regularly to make sure the arrangement is really working and to provide parent and child counseling, help in enrolling him in school, and access to healthcare. As we said goodbye, I hoped that Abdi would finally find a home where he would be safe in Hagedera. We asked him if he had yet met any of the curious children peeking through the fence at us and he shook his head. "He will soon play with them" said Nimo with a smile. "When he is ready, he will make new friends here". Allow me to give you an idea of this past weekend. Imagine a continuous dust storm that distorts your vision and blows into your nose and mouth as you breathe. Envision a rusty red and light yellow desert with thousands of white UNHCR tents peppered evenly as far as the horizon. Picture parents with sadness in their eyes and children without a smile as you pass them. This is Kobe refugee camp. It is where the 24,000 recently arrived refugees have been resettled. There are two other camps already at capacity (more than 40,000 people in each) and one scheduled to open later this week to accommodate the increasing refugee population. 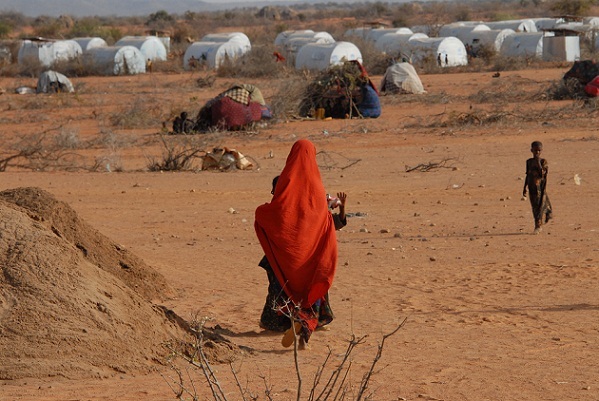 The refugees are from different parts of Somalia, with different cultures and dialects. Many children and adults are sick. Most are skinny and malnourished due to both their escape and the drought that is plaguing the region. They don’t even appear to have the hope or energy to talk. However, approach a man, woman or child and smile, offer your hand to shake theirs and say “hello, how are you” in some broken Somali and at once their facial expressions revive. Hope shines through their eyes and they become quite animated. You get a glimpse of who they are and what they have left behind. Just weeks ago, the people in front of me were teachers, farmers, shop owners, pastoralists, and traders. Some of the children attended school, some didn’t, and some worked herding the family goats and sheep. They had family lives, dreams, hopes and aspirations like you and me. Now they are dazed. In the refugee camps there is nowhere for the children to play or be safe, and there are strangers everywhere. Who actually lives in the camp and who comes from the surrounding areas is difficult to determine at this point. During the day, many children hide in their family tents. Some venture into the desert bush surrounding the camp. Who knows what can happen to them there. The transit center is even more jarring. Children walk through trash and human feces. Some are defecating in front of everyone, on top of heaps of discarded plastic and other materials. Children are emaciated. Makeshift tents of cloth strewn across branches give little refuge to the newcomers. The families will be in the transit center until they receive refugee status documentation. This may take days or weeks. People are in shock from their displacement. There is no telling what happened to them over the past couple weeks. What did they see? What pain did they endure over their journeys? Who did they lose? What from their experience will weigh heavily on them for the rest of their lives? How long will they be in the camp? How long will the drought in East Africa continue? Visit one of our nutrition tents and the knot in your heart intensifies. The children are so skinny you can see bones everywhere their clothes do not cover. Most just have a blank stare on their faces and do not notice you. Others lift their heads slightly and just gaze weakly. No smiles. I wonder how many children didn’t make it to the tent. I pray that the ones who are nourished back to health do not relapse in the coming months.